Celebrating art is always a great thing! Today we champion that feeling you get inside when you create or experience art—no matter what kind is your favorite. Paintings, books, music, sculpture, quilts, photography, and other arts show you a bit of the world in a new way—a way, perhaps, you’ve never thought of before. Art can inspire, gladden, sadden, anger, teach, and compel action. It can also provide joy and inspiration when you need it most—as you’ll see in today’s book. Celebrate today’s holiday by visiting a museum, bookstore, library, concert, or gallery. It was October of 1940, and after moving from place to place to stay “one step ahead of the German soldiers,” Aube and her family had found a home where they could “live together until it was their turn to flee to safety. The Villa Air-Bel was rented by Varian Fry—a magician—and his assistant Danny Bénédite and served as a place to hide those looking to escape the war-torn country. On Sundays, the house was full of “thinkers, artists and writers who had to hide from the German soldiers because of their ideas of freedom and liberty” like Aube’s parents. On those days, everyone played games, danced and made collages. One of Aube’s favorite games was Cadavre Exquis, in which a piece of paper was folded and each participant drew a design on one fold. When the whole paper was unfolded, amazing, artistic pictures emerged. These games and entertainment, Aube’s father told her, were their ways of fighting against fear. Because of the danger, many things had to be hidden at the Villa, including the radio and the cow that provided milk. Many ingredients for cooking were scarce. But even then Aube’s father used art to lighten the mood, leaving a drawing of a roast beef in the pantry where a real roast should have been. Because the authorities were reading Varian and Danny’s mail and were listening to their phone calls, they had devised a way of hiding messages in toothpaste tubes that escaped the guard’s searches. The messages went to other people helping along the escape route to tell them who to expect next. Everyone in the house also had to have a special hiding place in case the police came. Aube chose the an old cabinet in the kitchen. Image copyright Herb Leonhard, 2017, text copyright Gwen Strauss, 2017. Courtesy of Pelican Publishing Company. Whenever a new group of people were scheduled to “make the dangerous journey to a new country, they held a Sunday party and art sale to raise money.” Canvases painted by famous artists were hung among the branches of a large tree on the Villa grounds. When winter came, the Villa was so cold everyone had to wear all of their clothes to stay warm. They kept their spirits warm, too, by singing their favorite songs. Aube’s family were placed on a ship sailing to South America, and on February 18, 1941 they left the Villa and Danny and Varian behind and made the one-month-long journey to freedom. Several months later, Varian was “forced to leave France and return to America.” Danny went underground and “helped another 300 people escape France.” In 1943, however, Danny was “arrested by the Nazis and sentenced to death.” Just as he was facing the firing squad, soldiers fighting the Nazis burst through the gates of the camp and freed him and the other inmates. Image copyright Herb Leonhard, 2017, courtesy of Pelican Publishing Company. Gwen Strauss includes extensive backmatter on this true-life story about her great-uncle Danny Bénédite. A detailed account of the work by Varian Fry, Danny Bénédite, and the American Rescue Committee, complete with photographs, as well as short biographies of some of the artists who visited the Villa (and a compelling list of others) plus resources for further study round out this compelling book. Clearly written and with details from a child’s point of view that will resonate with readers, The Hiding Game is an absorbing tribute not only to two men involved in the Nazi resistance movement but to the resilience that uplifts people during the darkest times. This fascinating true story also offers a glimpse into the important role that artists and writers play in shining a light on history, interpreting it, and fighting against forces that destroy. Rich with the atmosphere of intrigue, suspense, and simple pleasures enjoyed, Strauss’s dynamic storytelling will thrill children. The Hiding Game will prompt them to learn more about this time period and will inspire in them their own acts of heroism. Herb Leonhard’s realistic drawings of the Villa Air-Bel, the families who stopped there on their way to freedom, the moments of joy that sustained them, and the secret measures necessary for people’s safety take readers into the heart of the story and allow them to witness the danger and the creativity that swirled side-by-side within the Villa and the people living there. Largely depicted in somber tones of gray and green, the pages brighten with glowing yellows during times of laughter, games, and creativity. An illustration of the mammoth tree hung with canvases by famous artists will impress children, and the final image will leave an indelible and thought-provoking impression on young readers and adults. An excellent book for facilitating discussions about World War II and the Holocaust with children at home and in the classroom as well as offering opportunities for cross-curricular learning in history, art, reading, and more, The Hiding Game is a superb choice to add to home, school, and public libraries. Discover more about Gwen Strauss and her books on her website. To learn more about Herb Leonhard, his books, and his art, visit his website. Art has a language all its own! 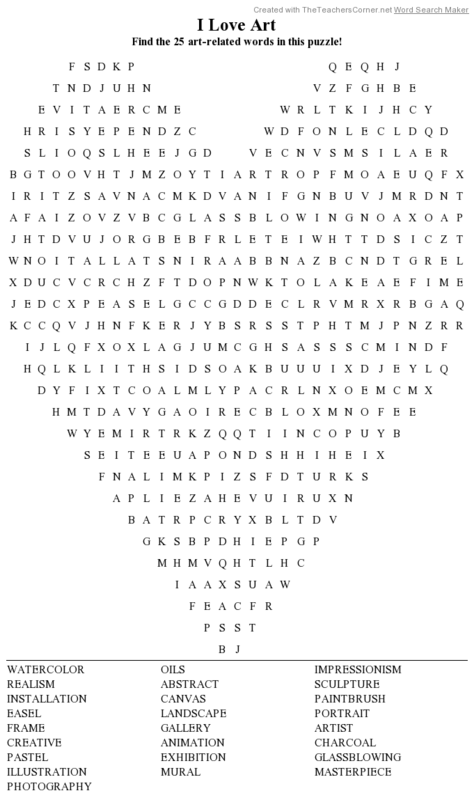 Have fun finding the twenty-five art-related words in this printable puzzle.